PRESALES ARE ALL GONE!!! THERE WILL BE 50 TICKETS AT THE DOOR. 20$ EACH STARTING AT 9:30pm 12/31/11 GET THERE EARLY TO GET A TICKET!!! THANK YOU JACKSON HOLE!!!!!!!! BANGIN! Events and Entertainment is proud to present the New Years Eve party at the Q Roadhouse on Dec. 31st 2011. We have a great evening full of top notch talent for you Jackson!! get ready to ring in the new years with a feast for your eyes and ears!! Its gonna go BIG. 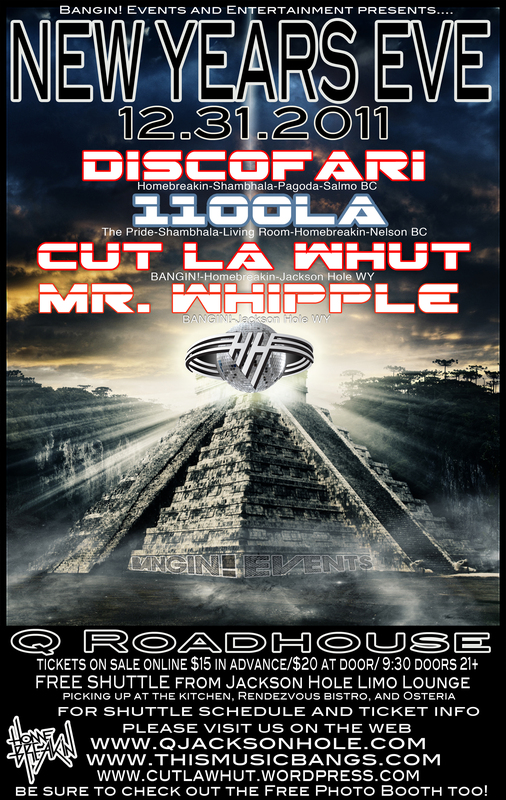 Discofari-11OOLA-Mr. Whipple-Cut la Whut are gonna be bringin it to you on the 1’s & 2’s, with a visual surprise that is next level!! Fine Dining Restaurant Group has arrange a FREE SHUTTLE from The Kitchen, Rendezvous Bistro, and Osteria for your convenience!! Shuttle will be picking up at The Kitchen and Rendezvous Bistro every 30 minutes starting around 9:15. Osteria will have a few shuttles running as well. You can also check http://www.qjacksonhole.com, or Bangin! Events Facebook or Q Roadhouse on Facebook for more information on that. Ticket link will be in the comments below and on all the websites mentioned above. Thank you for all your support and we are looking forward to bringing in 2012 with all of you! Cheers! This entry was posted in Uncategorized and tagged 11oola, Cut la Whut, dance, Discofari, jackson, jackson hole, New years, party, Q roadhouse, Wyoming. Bookmark the permalink.